Robin G’s glasswork is original in design, inspired by nature, and created with a sense of playfulness that she observes in her dogs, cats and horses. 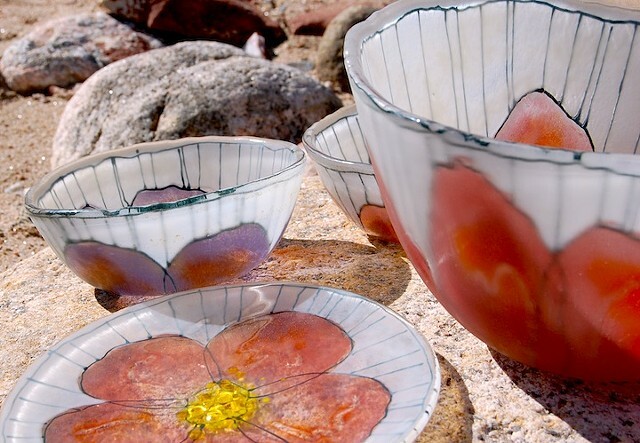 Her glass bowls and plates are made by fusing layers of powdered glass in a kiln, then slumping the flat object into a mold in a second or third firing. All pieces are individually made by hand, so no 2 will be exactly the same. Lately she has been working with many layers of glass fused in the kiln in many firings. These are built up layer by layer and become sculptures, table tops, wall art and other functional or artistic pieces. Robin has been working in the glass medium since 1971 and continues to find new and different ways to see her art. She shows her work in Boulder at the Boulder Arts & Crafts Gallery on the Pearl St Mall, in Denver at Show of Hands & other work can be seen on her blog. Special orders and requests are looked forward to and accepted as time allows.